A new report released today by the Basel Action Network (BAN) documents e-waste which was dropped off at Goodwill sites that partner with Dell for e-waste recycling, ended up being exported to Asian countries, in violation of Dell’s policy not to export e-waste to developing countries. The report titled, “Disconnect: Goodwill and Dell Exporting the Public’s E-waste to Developing Countries,” is the first of several reports from BAN’s new e-Trash Transparency Project. Map showing the relative export paths of the 200 tracker-enabled electronic equipment deployed by BAN in the e-Trash Transparency Project. Copyright BAN. 2016. As part of this two-year project, BAN put 200 electronic tracking devices inside used flat screen (LCD) TVs, CRT monitors, and printers (products that are commonly exported from the U.S. to developing nations) and then turned the TVs, monitors, and printers over to recyclers, charities, and retailers across the country. Then BAN partnered with the Massachusetts Institute of Technology’s Senseable City Lab (MIT-SCL), to map the routes taken by the trackers. The trackers would be easily discovered and removed by anyone disassembling these products for reuse. They are clearly marked with instructions to contact BAN if found. Therefore, it’s safe to conclude that trackers that were exported remained inside whole products. Today’s report focuses on the results from the trackers inside devices delivered to Goodwill stores. BAN delivered 46 of the total project’s 200 tracker-enabled electronic devices to Goodwill stores around the US— 28 of them at Goodwill stores that are collectors for Dell’s Reconnect program and 18 of them at Goodwill stores not associated with the Reconnect program. Only one of the 18 devices dropped at the non-Dell Reconnect stores, only was recorded as being exported. But six of the 28 devices (21%) dropped at Goodwill stores that were part of the Dell Reconnect public e-waste takeback were exported. Where did the Goodwill items go? Of the seven devices dropped off at Goodwill stores, four went to Hong Kong, (one printer and three LCD monitors), one went to Mainland China (one printer), one went to Taiwan (one LCD monitor), and one went to Thailand (one LCD monitor). According to the report, all of these exports were likely to be illegal under international law, and the importing countries’ laws. Dell partners with many of the Goodwill e-waste recycling programs under their Reconnect Program, whereby Goodwill collects the e-waste and Dell takes it and recycles it. 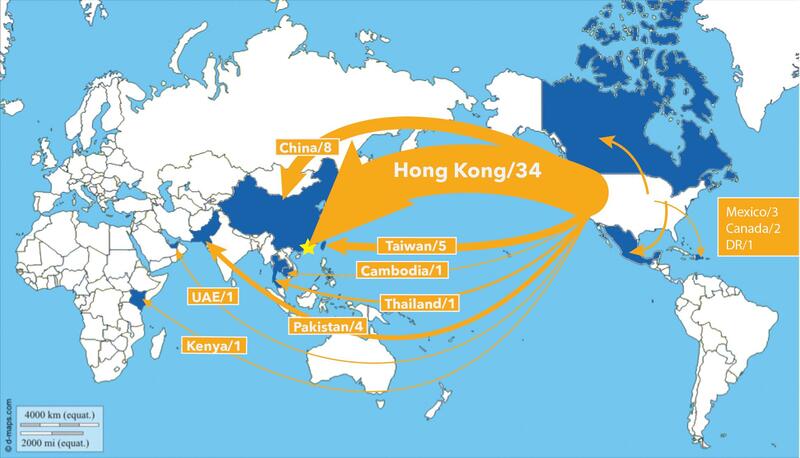 But the exports to China, Hong Kong, and Thailand found in this report clearly violate Dell’s policy of not exporting e-waste to developing countries. Dell has always had the clearest and strongest policy on e-waste exports in the industry. They were the first electronic manufacturer to announce such a strong policy in the U.S. So it’s particularly disappointing to see these results. But not entirely surprising. There have been several reports from recyclers over the years complaining that Dell (along with some other manufacturers) squeeze the recyclers they work with, paying them as little per pound as possible – less and less every year. Because commodity prices have fallen significantly in the last couple of years, already squeezed recyclers are challenged to manage these products (which contain toxic chemicals) responsibly without losing money. The three product categories in this study – LCD TVs, CRT monitor, and printers – are all money losers for recyclers at this point (assuming the panel from the LCD has no reuse value). So it’s not a big surprise to see these items go down the low road. While Dell has one of the toughest audit programs in the industry for their takeback system, no audit program can compensate if you don’t pay recyclers enough to manage the commodities responsibly AND make a little profit to stay in business. Not unless you are monitoring every single shipment. So if this is happening to Dell, the company with the highest standards and toughest audits, should we assume that other manufacturer takeback programs’ e-waste is also being exported to developing countries, even if they have a policy forbidding it? Stay tuned to BAN’s e-Trash Tranparency Project’s upcoming reports.